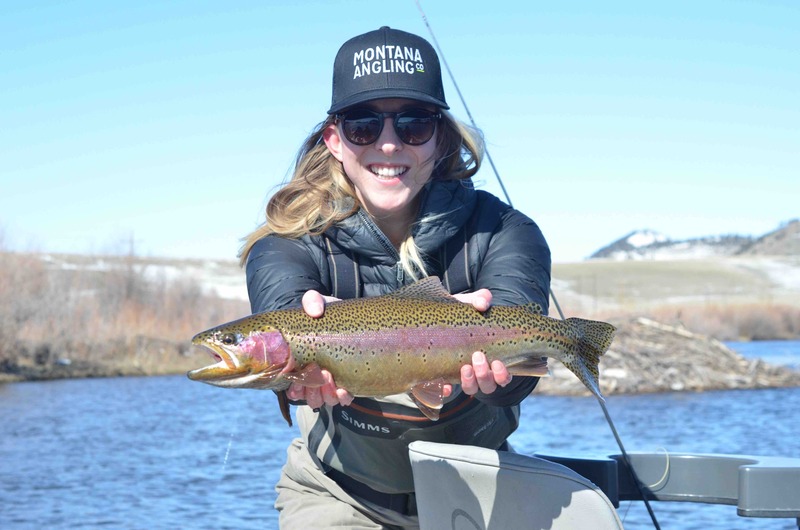 Fly fishing on the Missouri is the main event for anglers and our fly fishing guides in Montana during the Spring. The tailwater portion of the Missouri near the town of Craig, Montana kicks our season off with the first great dry fly fishing of the year in mid-April with daily hatches of midges and blue winged olives (BWOs). Guide trips go out regularly on this stretch of river starting April 1 and it is a great time of year to find solitude and lots of larger fish on the Missouri River. Streamer fishing and nymphing is also a solid bet all spring. The April hatches of BWOs continue through early May until water temperatures slowly start rising and flows crank up a bit. The Missouri river will experience an increase of flows, call it the run-off for the river, but continues to run cold and clear thanks to Holter dam. By May the weather will stabilize and our season gets kicked into high gear. There are days in May that can be cold and rainy, even snowy, but is consistently favorable for great angling opportunities. The warmer daytime temps also mean some great hatches and great fishing. The largest fish of the year are usually caught in May on the 'Mo. Sometimes they come on dries, sometimes streamers, and of course on nymphs, but know they are on the prowl. BWOs continue to come off daily through early-mid May and by May 15 you can usually count on caddis dancing all across the water. The Mother’s day caddis hatch on the Missouri River is something every angler needs to experience. At its best it is blankets of bugs drifting down the river and trout gorging themselves on them. This doesn’t mean they are easy to catch, but it can be a dry fly fisherman’s paradise. On higher water years the bugs are around in good numbers and there are fish looking to eat them, but nymphing can be more reliable. When flows peak over 10,000 CFS its not uncommon to have to go deep to consistently catch trout. While all of this is going on there are also a variety of other hatches to keep things interesting. March Browns, ants, beetles, some early PMDs, Callibaetis, and even a stonefly or two round out the May hatches. All of this makes for a fishing experience you’ve got to experience yourself. Our May trips on the Missouri River book fast and early so be sure to reach out early if you want in on the action.